I came to The Wonder Years a little late, having missed the first two seasons for reasons I won’t bother with here. It was at Diane’s urging, not long after we moved in together in late 1990, that I tuned in; and I’ve been thankful ever since, as it fast became (and remains) one of my favorite TV series. Not every episode was great, mind you, but when it hit on all cylinders few shows could match it – in my opinion, at any rate. Seven years later, at the behest of my boss at the time, I tuned in Homicide: Life on the Street at the start of its sixth season. It became yet another must-watch show in our household. Catching up and keeping up with both proved to be a chore, however – Wonder Years didn’t hit syndication until the fall of 1992; and Lifetime ran Homicide repeats at 1am during the week. Those were the years, too, when we were out and about more often than now, especially on Friday nights when the first-run Homicide aired. A VCR was a necessity. Of late, I’ve been reminded of the work, and space, once required of TV fans. For the past two weeks I’ve been sorting through hundreds of VHS tapes, some of which date to the early 1980s, transferring bits here and there to my computer and tossing the rest. 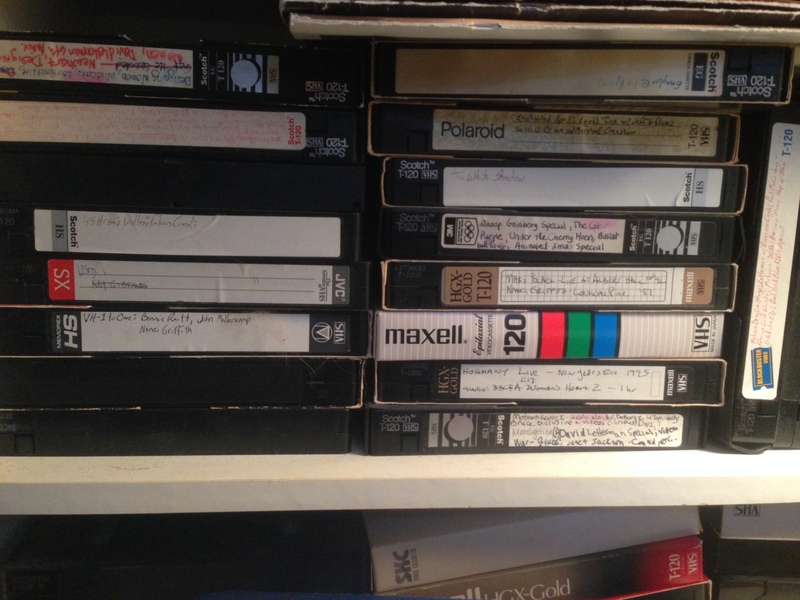 The tapes took up more than shelf space: an entire corner of our bedroom was devoted to them (notice the past tense there!). My closet holds even more. In any event, it’s a time-consuming project made possible by a simple gadget that connects the VCR to my computer; recording is in real time. The goal isn’t to save episodes of Wonder Years, Homicide or any of the many programs or movies we taped, however, as most of those are available elsewhere, but appearances of our favorite musical acts on Late Night With David Letterman, The Tonight Show, Arsenio Hall, TNN, VH1 and MTV, among other shows and channels. One thing I’ve learned: while commercials were as annoying then as now, at least then there weren’t as many per hour. Another: the local news hypes the weather a little less these days, and is more accurate. During one run of Oprah Winfrey shows (my wife used to record them) in December 1997, for instance, the teaser for the 5 o’clock news warned of an approaching winter storm. Doomsday was nigh! Until the actual day it arrived, that is, when lo’ and behold the snow turned out to be a dusting that only impacted parts of the region. And yet another: we once recorded an episode of Falcon Crest. I likely set the VCR to the wrong channel that night. The biggest lesson I’ve learned, however, is what a mess the analog world could be. For every tape filled with just Homicide episodes, there are five packed with a mishmash of our interests: The Wonder Years, The Simpsons and NYPD Blue share space with 10,000 Maniacs on Letterman. To watch a marathon of a specific show back then required forethought and effort, in other words. We once threw a “My So-Called Party” in honor of My So-Called Life; friends/fellow fans came over and we screened four episodes that were on three different cassettes. That meant swapping them out, fast-forwarding through squealing yards of tape to find the episodes we wanted and then fast-forwarding again through the commercial breaks. Like others, no doubt, we became infatuated with DVDs once they hit the stores and rental markets. But though we still purchase DVDs on occasion, we’ve come to prefer the no-space-required world that is OnDemand, Netflix and Amazon Prime. There’s no rewinding, fast-forwarding or guesstimating the length of a movie just to get to what the tape’s label claims follows. In fact, these days our “My So-Called Party” would simply require us to navigate to Streampix on Comcast OnDemand, and then click on the episodes we wanted. No muss, no fuss, just fun! Except for those nights when you can’t find anything to watch. That, in fact, is my main gripe: quality content, or lack thereof. Every program should be available at the push of the button – a video Spotify, if you will – not just some. But that’s a post for another day.